Special Olympics Equestrian Events Taking Place This Friday & Saturday! Good morning Tampa Bay, Alex here to let you know about a fun event for a good cause happening this weekend. Hillsborough County’s Bakas Equestrian Center is hosting Special Olympics Equestrian Events on the evening of Friday, April 1 and all day on Saturday. April 2. More than 30 Bakas Equestrian Center riders will be competing against riders from Pasco and Hernando counties. Events will end around 4 p.m. The Bakas Equestrian Center is part of the Hillsborough County Parks, Recreation and Conservation Department. Since 1987, this therapeutic recreation program has been working to help thousands of disabled riders every year. 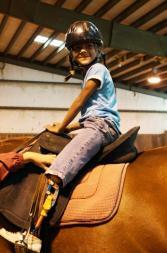 The Center hosts riding lessons for children and adults who have physical and/or mental disabilities. It also offers riding to the general public, including scheduled trail rides and birthday parties. Good Luck to all of you riders participating in the race this weekend! For additional information on the Special Olympics Equestrian Events, call (813) 264-3890 or click here. Check back with us throughout the week for more information on Things To Do In Tampa Bay!